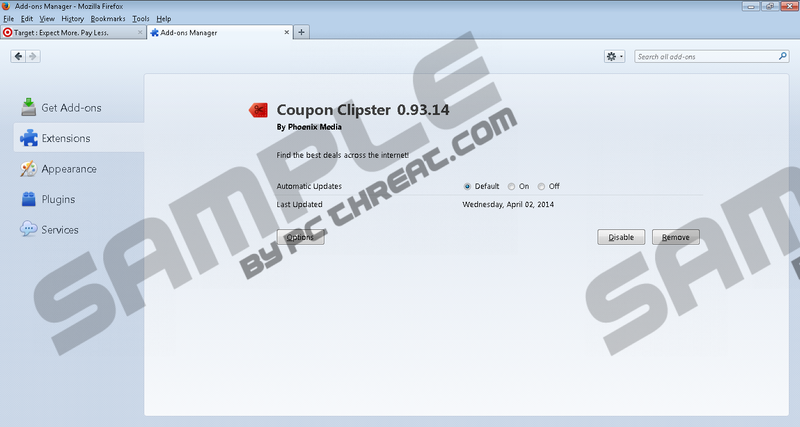 Coupon Clipster Ads are displayed by Coupon Clipster adware that may enter your system in several ways. It can be downloaded at couponclipster.com. However, users seldom download adware from their official home pages, so we can pay more attention to secondary distribution method that, most of the cases, is the main one – bundled downloads. If you download Mobogenie, Optimizer Pro, Conduit Search Protect and other freeware applications via domalQ downloaders, chances are you will get Coupon Clipster Ads installed on your PC as well. Thankfully, you can remove Coupon Clipster Ads via Control Panel, as this application is not a malicious computer infection. Nevertheless, you should not ignore this adware application, because it may be highly intrusive. Adware applications fall into the grey software category, because they are not extremely dangerous, and yet at the same time computer safety-minded users would not want the likes of Coupon Clipster Ads on their computers. Adware applications can expose system vulnerabilities to malevolent third parties and you definitely would not want that to result in a dangerous infection. It is a far-fetched consequence of clicking on a pop-up, but it does happen from time to time, so you should not rule that out completely. Based on our security research, Coupon Clipster Ads install extensions on Mozilla Firefox and Internet Explorer. Before you start seeing any pop-ups, these extensions collect information on what websites you visit, so that they could make your internet profile. Once the information is processed and the adware “knows” more or less what you search online for, Coupon Clipster Ads starts displaying various coupons and discount offers whenever you access BestBuy, Zappos, Staples, PetSmart and other supported online shops. According to couponclipster.com, the application “will let you know when there are coupons by showing a counter in the top right of websites”, and “coupons from Coupon Clipster apply with a single click, making it easier than ever to apply savings to your online purchases”. It may seem that Coupon Clipster Ads could be useful, but make sure there are no additional requirements when you are about to apply a coupon or purchase something offered by Coupon Clipster Ads. The main reason why you should remove Coupon Clipster Ads is the potential exposure and exploitation by malevolent third parties. However, if you terminate all the unwanted applications from your computer and invest in a reliable security tool, you can be sure that you will avoid potential threats in the future. Open Uninstall a program and remove Coupon Clipster. Select Uninstall a program and remove Coupon Clipster. Open Add or remove programs and uninstall Coupon Clipster. Quick & tested solution for Coupon Clipster Ads removal.